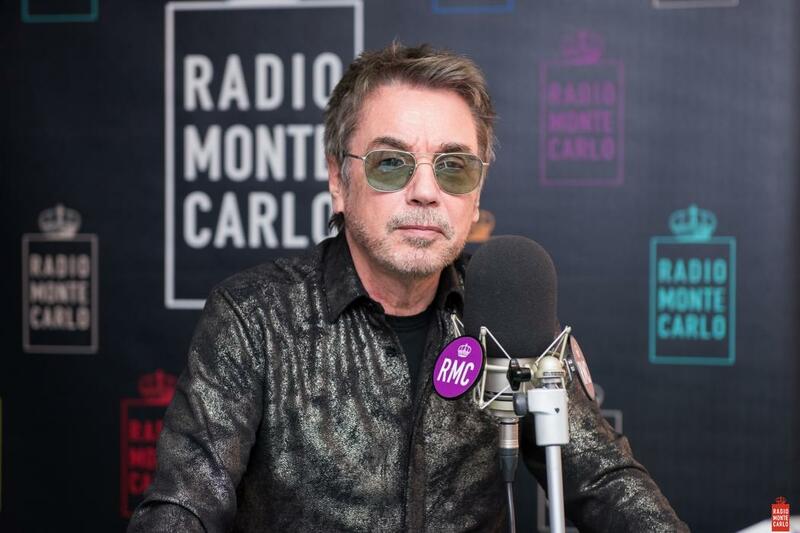 Jean-Michel Jarre was a guest of Radio Monte Carlo for a thrilling interview with Nick The Nightfly. There has been talk of music, the future and new technologies, including cinematographic suggestions and the charm of old vinyl. I´m on my way to NYC for a couple days of promo. I will be doing a Facebook Live Interview with Mixmag tomorrow Wednesday 11:30am ET. Please join if you can. 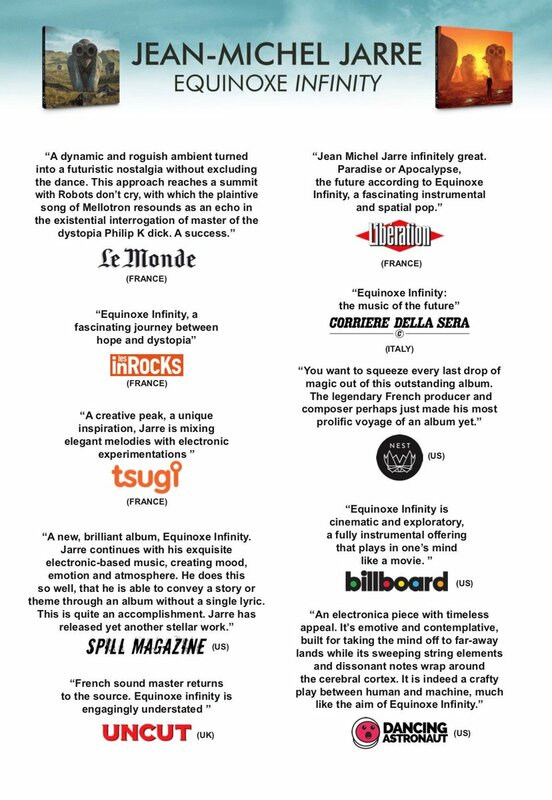 With this album (and the last 3), I can see how much truly Jarre has become irrelevant to electronic music. Which I don't say with any joy. I'd say I agree with most of what you wrote, but I definitely disagree on Oxygène 3. I honestly think it hit a sweet spot without trying too hard to mimic the original while still feeling like "Oxygène" more or less. That's where Oxygène 7-13 failed IMO. It tried too hard to be like its predecessor and it's really on the edge of a "fan tribute"/"parody" territory (Oxygène 9 and 13 especially). That's why I resent people saying "Oh, Robots Don't Cry should've clearly been on Oxygène 3!". No, it shouldn't! It would've ruined it its "independence" and thus it would fall into the self-parody category. With regards to EI vs O3, O3 feels to be much more coherent and not so busy - because, if we are to believe JMJ, he limited himself to 8 tracks, just like on the original. With EI I feel like I'm constantly bombarded with seemingly random sounds and instruments. It's like the album is constantly trying to grab my attention with "ear-candy". And while EI is not a sequel to Équinoxe... it kinda makes the same mistake as Oxygène 7-13 did - I tries too hard to reference the original. The almost direct quote from Équinoxe 1 in The Watchers. Or how the "If the wind could speak" (frankly, one of the better tracks on the album) is the new "Band in the rain". Or how "Infinity" kind of references Équinoxe 5. Or how Movement 6-7-8 tries to mimic the continuity of Équinoxe 5-6-7 - which, by the way, it does very poorly: the transitions are hardly seamless, it's very easy to pinpoint where the bass sound changes (both at start and end of "Machines are learning"); and not only that, when the bass intro of Movement 7 is done the main theme starts 1/16th note too early! (I can't stand how it throws off my brain-metronome); the tempo of Mvt6 (♩ = 100) doesn't match that of Mvt7 (♩ = 97.5). If someone handed me this album and didn't say it wasn't JMJ I would probably say it's a "JMJ fan tribute" at best (and if Équinoxe 1 wasn't quoted in The Watchers I probably wouldn't even label it as such) - I probably wouldn't have said "oh, that's gotta be JMJ". But then again, to be fair, I probably wouldn't have guessed that Revolutions was JMJ if someone had handed me it in 1988. Yes, I believe at some point music and videogames will become totally nested one inside the other. A bit like Jarre did with Odyssey through O2. Jean-Michel Jarre : "l'électro, c'est comme la cuisine, on bidouille !" 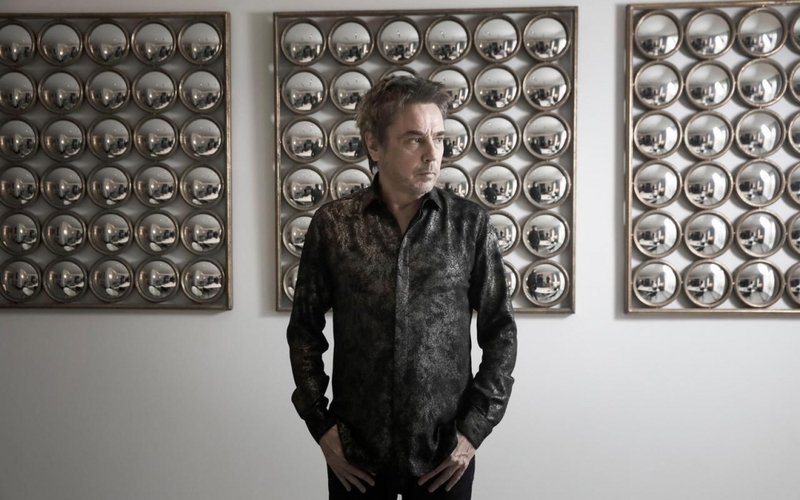 Discussing music, sci-fi, and more with French electronic music icon Jean-Michel Jarre. It's always great speaking with him. Podcast episode coming next month! 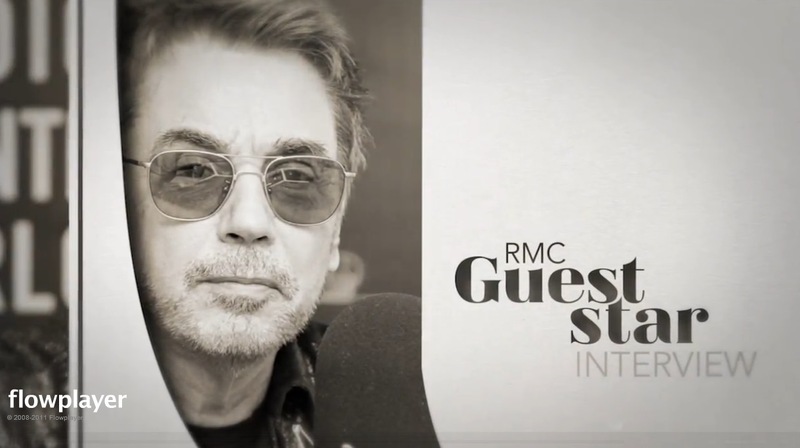 Jean-Michel Jarre: "You have to play in North Korea and Iran"
Jean Michel Jarre was a guest of Monte Carlo Nights for a fascinating interview with Nick The Nightfly on the future of music, between technology and return to vinyl. Jarre talked about his most famous records and his future projects. And he also revealed one of his dreams: a memorable show in Venice. That was exactly what I was looking for, I can't force the download via Firefox. Thanks, Doc. I think Jarre lost a lot of his real... He want to be a modern artist with modern terms and all but he is a "want to be"… Like the Equinoxe infinity for examle. This has nothing to do with the original Equinoxe, which was a master piece.... It is just nothing. Equinoxe infinity will never be legendary than the original, because it is not good. I don't like the name "Watchers" what he now call these days. That sound so stupid. Don't give suddenly a name on a legendary cover, wich was used to be "Le trac" from Granger. Mr. Jarre, you don't have it anymore.... Time to go retired. Sorry fanclub. That is the way it is and also my opinion. I think that Elektronalin's Equinoxe 12 is actually a pretty good "Equinoxe 4-a-like", but most of the other ones are usually far too cringeworthy. Ooh, what did he say?